Changes in the skin... Basal cell cancer often begins as a small, pale patch that enlarges slowly, producing a central "dimple" and eventually an ulcer. Parts of the ulcer may heal, but the major portion remains ulcerated. Some basal cell cancers show colour changes. Other kinds of cancer, including squamous cell cancer and malignant melanoma, also occur on the skin of the head and neck. Most squamous cell cancers occur on the lower lip and ear. They may look like basal cell cancers and, if caught early and properly treated, usually are not much more dangerous. If there is a sore on the lip, lower face, or ear that does not heal, consult a physician. Malignant melanoma classically produces dense blue-black or black discolorations of the skin. However, any mole that changes size, colour, or begins to bleed may be trouble. A black or blue-black spot on the face or neck, particularly if it changes size or shape, should be seen as soon as possible. Melanoma is a disease in which malignant (cancer) cells form in the skin cells called melanocytes (cells that colour the skin). 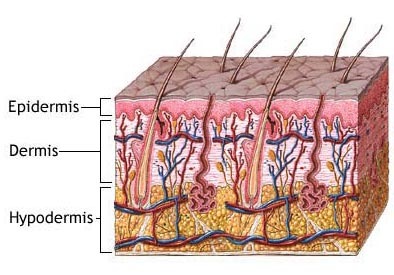 Melanocytes are found throughout the lower part of the epidermis. They produce melanin, the pigment that gives skin its natural colour. When skin is exposed to the sun, melanocytes produce more pigment, causing the skin to tan, or darken. 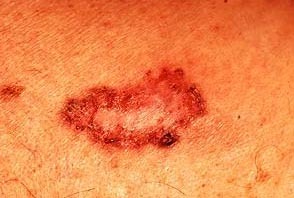 When melanoma starts in the skin, the disease is called cutaneous melanoma. Melanoma may also occur in the eye and is called ocular melanoma or intraocular melanoma. A mole that: changes in size, shape, or colour; has irregular edges or borders; is more than 1 colour; is asymmetrical ie if the mole is divided in half, the 2 halves are different in size or shape; itches; oozes, bleeds, or is ulcerated - a hole forms in the skin when the top layer of cells breaks down and the underlying tissue shows through. Change in pigmented (coloured) skin. Skin examination: A doctor or nurse examines the skin to look for moles, birthmarks, or other pigmented areas that look abnormal in colour, size, shape, or texture. 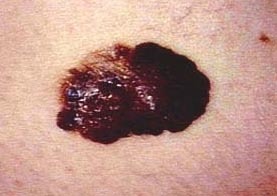 The stage of melanoma (whether cancer is found in the outer layer of skin only, or has spread to the lymph nodes or to other places in the body). The location and size of the tumour. After melanoma has been diagnosed, tests are done to find out if cancer cells have spread within the skin or to other parts of the body. 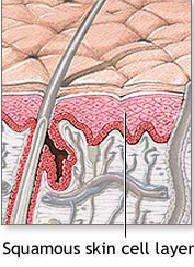 The process used to find out whether cancer has spread within the skin or to other parts of the body is called staging. The information gathered from the staging process determines the stage of the disease. It is important to know the stage in order to plan treatment. Lymph node mapping and sentinel lymph node biopsy: Procedures in which a radioactive substance and/or blue dye is injected near the tumour. The substance or dye flows through lymph ducts to the sentinel node or nodes (the first lymph node or nodes where cancer cells are likely to have spread). The surgeon removes only the nodes with the radioactive substance or dye. A pathologist then checks the sentinel lymph nodes for cancer cells. If no cancer cells are detected, it may not be necessary to remove additional nodes. PET scan (positron emission tomography scan): A procedure to find malignant tumour cells in the body. A small amount of radionuclide glucose (sugar) is injected into a vein. 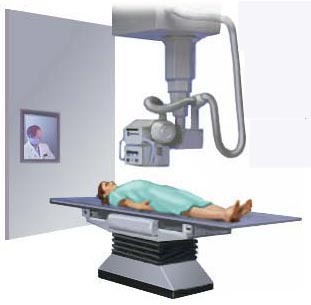 The PET scanner rotates around the body and makes a picture of where glucose is being used in the body. Malignant tumour cells show up brighter in the picture because they are more active and take up more glucose than normal cells. In stage IA, the tumour is not more than 1 millimetre (less than 1/16 of an inch) thick, with no ulceration (a hole that forms in the skin when the top layer of cells breaks down and the underlying tissue shows through). The tumour is in the epidermis and upper layer of the dermis. 1 to 2 millimetres (more than 1/16 inch) thick, with no ulceration. 2 to 4 millimetres (a little more than 1/8 of an inch) thick, with no ulceration. more than 4 millimetres thick, with no ulceration. In stage IIC, the tumour is more than 4 millimetres thick, with ulceration. 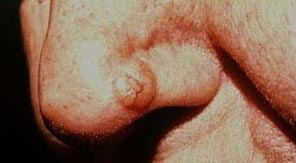 In stage III, the tumour may be of any thickness, with or without ulceration, and may have spread to 1 or more nearby lymph nodes. Stage III is divided into stages IIIA, IIIB, and IIIC. In stage IIIA, the cancer may have spread to as many as 3 nearby lymph nodes, but can only be seen with a microscope. In stage IIIB, the cancer either: has spread to as many as 3 lymph nodes and may not be visible without a microscope; or has satellite tumours (additional tumour growths within 1 inch of the original tumour) and has not spread to lymph nodes. has satellite tumours and may have spread to lymph nodes. In stage IV, the tumour has spread to other organs or to lymph nodes far away from the original tumour. Recurrent melanoma is cancer that has recurred (come back) after it has been treated. The cancer may come back in the original site or in other parts of the body, such as the lungs or liver. Different types of treatment are available for patients with melanoma. Some treatments are standard (the currently used treatment), and some are being tested in clinical trials. Before starting treatment, patients may want to think about taking part in a clinical trial. A treatment clinical trial is a research study meant to help improve current treatments or obtain information on new treatments for patients with cancer. When clinical trials show that a new treatment is better than the "standard" treatment, the new treatment may become the standard treatment. Sentinel lymph node biopsy: The removal of the sentinel lymph node (the first lymph node the cancer is likely to spread to from the tumour) during surgery. A radioactive substance and/or blue dye is injected near the tumour. The substance or dye flows through the lymph ducts to the lymph nodes. 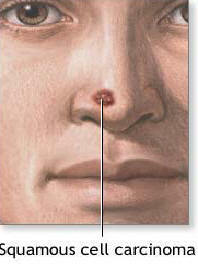 The first lymph node to receive the substance or dye is removed for biopsy. A pathologist views the tissue under a microscope to look for cancer cells. If cancer cells are not found, it may not be necessary to remove more lymph nodes. Chemotherapy is a cancer treatment that uses drugs to stop the growth of cancer cells, either by killing the cells or by stopping the cells from dividing. When chemotherapy is taken by mouth or injected into a vein or muscle, the drugs enter the bloodstream and can reach cancer cells throughout the body (systemic chemotherapy). When chemotherapy is placed directly in the spinal column, a body cavity such as the abdomen, or an organ, the drugs mainly affect cancer cells in those areas. In treating melanoma, chemotherapy drugs may be given as a hyperthermic isolated limb perfusion. This technique sends anticancer drugs directly to the arm or leg in which the cancer is located. The flow of blood to and from the limb is temporarily stopped with a tourniquet, and a warm solution containing anticancer drugs is put directly into the blood of the limb. This allows the patient to receive a high dose of drugs in the area where the cancer occurred. The way the chemotherapy is given depends on the type and stage of the cancer being treated. Other types of treatment are being tested in clinical trials. Chemoimmunotherapy is the use of anticancer drugs combined with biologic therapy to boost the immune system to kill cancer cells. Treatment of stage 0 melanoma is usually surgery to remove the tumour and a small amount of normal tissue around it. Surgery to remove the tumour and some of the normal tissue around it. A clinical trial of surgery to remove the tumour and some of the normal tissue around it, with or without lymph node mapping and selective lymphadenectomy. A clinical trial of new techniques to detect cancer cells in the lymph nodes. A clinical trial of lymphadenectomy with or without adjuvant therapy. Surgery to remove the tumour and some of the normal tissue around it, followed by removal of nearby lymph nodes. Lymph node mapping and sentinel lymph node biopsy, followed by surgery to remove the tumour and some of the normal tissue around it. If cancer is found in the sentinel lymph node, a second surgical procedure can be performed to remove additional nearby lymph nodes. Surgery followed by high-dose biologic therapy. A clinical trial of adjuvant chemotherapy and/or biologic therapy, or immunotherapy. Surgery to remove the tumour with skin grafting to cover the wound caused by surgery. Surgery followed by biologic therapy. A clinical trial of surgery followed by chemotherapy and/or biologic therapy. A clinical trial comparing surgery alone to surgery with biologic therapy. A clinical trial of chemoimmunotherapy or biologic therapy. A clinical trial of hyperthermic isolated limb perfusion using chemotherapy and biologic therapy. A clinical trial of biologic therapy and radiation therapy. Surgery as palliative therapy to relieve symptoms and improve quality of life. A clinical trial of new chemotherapy and/or biologic therapy, or vaccine therapy. A clinical trial of radiation therapy as palliative therapy to relieve symptoms and improve quality of life. A clinical trial of surgery to remove all known cancer. Surgery to remove the tumour. Basal cell cancer is the most common type of non-melanoma skin cancer. It usually occurs on areas of the skin that have been in the sun. Often this cancer appears as a small raised bump that has a smooth, pearly appearance. Another type looks like a scar, and it is firm to the touch. Basal cell cancers may spread to tissues around the cancer, but it usually does not spread to other parts of the body. Surgery to remove the cancer and as little of the normal tissue as possible. During the surgery, the doctor removes the cancer and then uses a microscope to look at the surgical area to make sure no cancer cells remain (micrographic surgery). Surgery to remove the cancer from the skin along with some of the healthy skin around the cancer. Surgery that uses an electric current to dehydrate the tumour (electro-desiccation), then uses a specialized surgical tool (curette) to remove the tumour. Surgery that freezes and kills the cancer (cryosurgery). A clinical trial of biological therapy. A technique that uses light-sensitive drugs to kill the cancer (photodynamic therapy). It is important to have the skin examined regularly so the cancer can be treated if it comes back (recurs). Squamous cell tumours also occur on areas of the skin that have been in the sun, often on the top of the nose, forehead, lower lip, and hands. They may also appear on areas of the skin that have been burned, exposed to chemicals, or had x-ray therapy. Often this cancer appears as a firm red bump. Sometimes the tumour may feel scaly or bleed or develop a crust. Squamous cell tumours may spread to the lymph nodes in the area (lymph nodes are small bean-shaped structures that are found throughout the body; they produce and store infection-fighting cells). 1. Surgery to remove the cancer and as little of the normal tissue as possible. During the surgery, the doctor removes the cancer and then uses a microscope to look at the surgical area to make sure no cancer cells remain (micrographic surgery). 2. Surgery to remove the cancer from the skin along with some of the healthy skin around the cancer. 3. Surgery that uses an electric current to dehydrate the tumour (electro-desiccation), then uses a specialized surgical tool (curette) to remove the tumour. 7. Surgery using a highly focused beam of light that destroys only the cancer cells (laser therapy). 8. A clinical trial of biological therapy with or without chemoprevention therapy. It is important to have the skin examined regularly so the cancer can be treated if it comes back.